Whether you’re a reloader, cartridge collector, or a serious firearms enthusiast, you’ll master the universe of ammunition with Cartridges of the World, 15th Edition. The most widely read reference on the topic, the book has been the go-to resource for serious firearms owners and ballisticians for years. Whether you’re a reloader, cartridge collector, or a serious firearms enthusiast, you’ll master the universe of ammunition with Cartridges of the World, 15th Edition. The most widely read reference on the topic, the book has been the go-to resource for serious firearms owners and ballisticians for years. And with updated cartridge listings, ballistics data and features, this new volume keeps shooters abreast of the latest developments in the world of ammunition, while still keeping tabs on vintage and wildcat ammo. Cartridges of the World, 15th Edition is freshly expanded to include 50 new cartridges in its fully illustrated 680 pages and covers everything from factory loads to trending wildcat ammunition. Each cartridge — new and old — features an article on its history, development, design, application and idiosyncrasies. Along with this, each listing includes a detailed data chart outlining the cartridge’s performance in its most common loads. This vital information is certain to get handloaders and shooters of every stripe hitting a bull’s eye with their favorite cartridge. 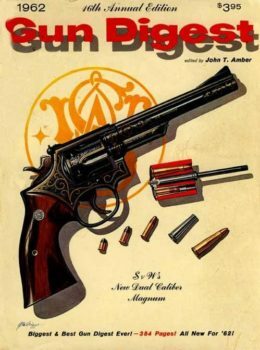 Cartridges of the World, 15th Edition also includes a full-color feature section of articles penned by gun-industry heavy hitters. Experts such as Philip Massaro, Bob Campbell and Robert Sadowski plumb the depths of the cartridge world, giving rare insight into rifle, handgun and shotgun ammo. Combined with the technical information, this resource is a veritable graduate course in cartridges. Whether you’re a shooter aiming to better understand your ammunition or a reloader shooting to perfect a cartridge, Cartridges of the World 15th Edition is certain to get you on target. No serious shooter’s library is complete without it. W. Todd Woodard has been editor of Gun Tests magazine for over 15 years and is an avid rifle, handgun and shotgun shooter. He’s the author of several books, including Brownell’s Guide to 101 Gun Gadgets, and is a regular contributor to the Gun Digest annual as well as several firearms, outdoors, political and news publications.